For all the fascinating topics that the brand ambassador of a microdistillery could expound upon – the distillation process, the challenges of running a small business, the snazzy vintage pickup truck used to make liquor deliveries – it’s noteworthy how much time GrandTen Distilling’s Lonnie Newburn spends talking about labels. No, I don’t mean “The GrandTen Label,” as in the line of craft spirits that have won favor among local mixologists and praise from national media. I mean the actual, physical labels on the bottles. Lonnie points out the text and numbering on each label, signifying batch and bottle numbers. He comments on the style, shape, and length of the labels, even the type of paper used. He hints at images hidden among the floral designs of GrandTen’s line of cordials. More than anything, Lonnie groans whenever he notices a label that’s askew, however imperceptible it may be to the untrained eye. “That label’s crooked because of me,” he mutters. To the average person taking a tour of GrandTen’s South Boston facility, label design and placement might not be the most exhilarating subject of the day. But when you’re one of four individuals responsible for ushering a completely handmade spirit from still to bottle to shelf, details like that are important. And if they obsess that much about the adhesive affixed to the bottle, you can imagine how much care goes into the product behind it. One of only two distilleries in the city of Boston, GrandTen Distilling has its roots in a business plan that Matthew Nuernberger, the distillery’s co-owner and president, wrote for his MBA program at Babson College. Upon graduating, he teamed up with his cousin, fellow co-owner and head distiller Spencer McMinn, who had earned a PhD in chemistry from the University of Virginia. Armed with business savvy and scientific know-how, they acquired space in Southie in 2010 and set about creating small-batch spirits for a savvy drinking public with a growing appreciation for craft cocktails and quality ingredients. After clearing the innumerable regulatory and licensing hurdles that all would-be distillers must face if they want their product to be considered something other than moonshine in the eyes of the law, in April 2012 the cousins finally unveiled their first spirit – an American gin. Less than three years later, GrandTen has emerged as one of the most respected regional players in a fast-growing craft spirit movement. They’re certainly one of the most visible. It’s not difficult to spot GrandTen doing business around town, considering their distinctive mode of transportation – a 1966 Ford F-100 pickup truck, custom-painted “Steve McQueen Green” and sporting the GTD logo. Finding the spirits isn’t hard, either. Today there are nine original GrandTen products, which appear on the shelves of more than 300 Massachusetts bars, restaurants, and liquor stores. Distribution has expanded to Connecticut, Rhode Island, and Pennsylvania (and, oddly enough, Washington state), and when I toured the distillery a few weeks ago, they were readying their first international shipment. Not bad for a company that only recently hired its fourth full-time employee. While GrandTen is still a young company, the nondescript Andrew Square facility out of which it operates has deep local roots and a colorful history. It was built as an iron foundry in the early 19th century by renowned metallurgist Cyrus Alger. The foundry supplied munitions to the U.S. government, including cannon balls used during the War of 1812. Later, the foundry’s focus shifted from weapons to wire production, and then lived a long life as a series of machine shops, small production companies, and automotive repair facilities. When GrandTen took over the old foundry, it had fallen into disrepair and was in need of extensive renovation. Remarkably, some of the original structure remains – its rafters and wooden support beams have weathered the passage of time and imbue the space with a sense of tradition and longevity. But despite the building’s historical aura, the distillery looks pretty much like your average industrial warehouse – plastic buckets and hoses strewn across a concrete floor, tools lying on tables, piles of cardboard boxes and packing materials, brooms leaning against walls. Of course, most warehouses don’t have a 50-gallon copper still in the back. The Adolf-Adrian Brennereianlagen still, which Lonnie affectionately refers to as “Adrian,” is believed to be one of only five of its kind in the United States. With its spherical dome, various portholes, and a tall distillation column that looks like an upraised arm, Adrian vaguely resembles a killer robot from a 1950s sci-fi movie. But Adrian only does good deeds – nearly every day, he’s busy heating, cooling, and infusing the liquids that will become GrandTen’s next batch of spirits, from their flagship gin to more experimental items. Next to Adrian is a 1,000 gallon fermenter, and a storage tank beyond that. All throughout the distilling area is evidence of the copper still’s output – oak barrels that have recently been hammered shut, pallets of whiskey ready to be shipped, bottles of gin awaiting labels. The sweet aroma of molasses used in GrandTen’s new rum permeates the entire room, and on the floor is a large pile of chipotle peppers that had been infusing a batch of spicy vodka earlier that day. The peppers are locally grown, as are nearly all of the ingredients GTD uses – yeast for the rum comes from the Trillium brewery in Fort Point, and botanicals deployed in the gin are purchased from Christina’s, a spice shop in Cambridge’s Inman Square. As Lonnie explains, it’s an approach that benefits the spirits as well as the community. “Using local products certainly brings a better flavor to the end spirits, keeps more money in Massachusetts, and ensures freshness,” he says. The tour moves from the production area to the distillery’s front room, where dozens of spirits are aging in barrels. GrandTen barrel-ages six of its products – a not insignificant investment of time and resources for a small distillery. Some of those barrels hold GrandTen’s forthcoming tenth product – an apple brandy, which Lonnie calls “a true New England classic.” The brandy will stay in the barrels for at least another year, but judging by Lonnie’s enthusiasm, it will be worth the wait. “We crushed thousands of pounds of red New England apples, fermented them on the skin, and distilled a truly delicious, creamy, caramel, and effervescent red apple brandy that has been aging for over 2 years now,” he says. But there’s no need to wait for GrandTen’s other spirits, and after learning how they’re made, it’s time to find out how they taste. Much like the facility as a whole, the tasting area is a functional, bare-bones affair. There’s a roughly cut concrete bar, behind which are shelves lined with bottles of GrandTen and a few mixers. 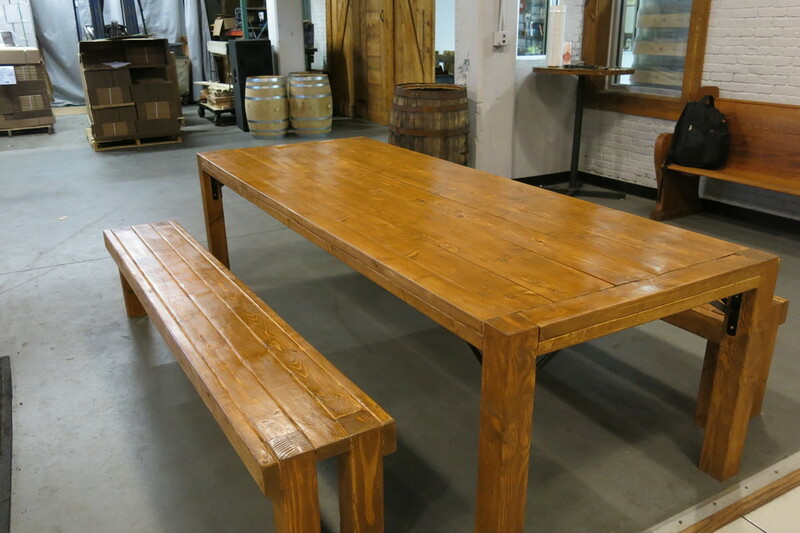 Two large wooden tables are fairly recent additions to the tasting room, handmade by the GrandTen crew to get visitors more involved in the tasting process. Visitors should get comfortable, too, because there’s plenty to sample. The tasting begins with Wire Works American Gin, the name of which is a nod to the foundry’s previous life as a wire works. American gins tend to be less strict than traditional London dry gins in their use of botanicals. While all gins must use juniper, which contributes the spirit’s distinctive pine flavor, Wire Works dials back that herbal pungency in its botanical blend. The result is a clean, balanced, highly drinkable gin, with notes of white pepper, citrus, and Angelica root. The botanical recipe is secret, of course, but Lonnie reveals one of the more unusual ingredients – cranberries, which don’t impart flavor but add acidity and contribute to mouthfeel. The Wire Works Special Reserve that Lonnie opens next was bottled that very day. It’s the exact same gin as the Wire Works, except it spends a year aging in American oak bourbon barrels. The barrel aging accounts for the gin’s darker complexion and, more importantly, its whiskey-like complexity. It’s a warmer spirit with a bit of spice in the nose and soft notes of vanilla at the end. The Special Reserve is similar to an “Old Tom” style of gin, so it works well in a Martinez, but can just as easily substitute for whiskey in cocktails. Speaking of whiskey, the South Boston Irish Whiskey is the only GrandTen product that isn’t made entirely on the premises. The whiskey is fermented in Ireland and shipped to the South Boston distillery, where it’s blended, aged in bourbon barrels, and bottled. The whiskey arrives from the Emerald Isle in a fairly raw state, often with pieces of wood and charred oak floating in it. The wood chunks get strained out, of course, but the oaky essence remains, combining with sweet cinnamon spice and notes of banana. Medford Rum may be GrandTen’s newest offering, but it’s been hanging around the distillery longer than any other spirit. Aged for two years in charred American oak barrels, the Medford Rum is what Lonnie calls an “old, tavern-style rum.” It hearkens back to the colonial era, when Massachusetts was home to upwards of 30 rum distilleries. Rums made in Medford were especially renowned for their superior quality, and the term “Medford rum” became a general way to refer to any dark, full-flavored rum. The last of those classic rum distilleries closed before Prohibition, but GrandTen picks up the trail with this updated version. Made with blackstrap molasses, the dark, thick liquid that remains after sugar has been boiled out of raw cane syrup, it’s noticeably less sweet than typical rums. With clear notes of butterscotch on the nose and rich caramel flavors, this is a smooth, complex rum that recalls the flavor of a Werther’s Original candy. Without exaggeration, this is unlike any rum I’ve ever tried, a fact Lonnie attributes to the choice of local products. “Trillium provides us with a blend of New England yeasts that give the rum a regional character that simply cannot be reproduced with commercially available yeast strains,” he says. The rum seems like a tough act to follow, and I’m not sure what to expect as we move into GrandTen’s line of cordials. Cloying sweetness? Herbal intensity? Names like “Amandine” and “Angelica” offer scant clues about the character of the liqueurs, and the label on one bottle appears to be marred by an inexcusable typo. But one sip of the Amandine immediately alleviates my concern. This barrel-aged almond liqueur recently drew praise from the Wall Street Journal, which lauded GrandTen’s “less-is-more approach to Amaretto.” With a pure, full-flavored almond character and a unique mouthfeel, the Amandine recalls the softness and warmth of a homemade almond biscuit. The Angelica, meanwhile, utterly defies categorization. Described as a “botanical liqueur,” the name derives from the spirit’s primary ingredient – Angelica root, a tan-colored herb with a sweet, earthy flavor and hints of anise. The eponymous herb is used to great effect in the cordial, combining with notes of cinnamon, clove, and juniper for an entirely unique liqueur. It would be like St. Germain and chartreuse having a kid; the Angelica lacks the brightness of St. Germain and the bitterness of chartreuse, but maintains an aromatic, floral essence and a fragrant bouquet of spices. All throughout the tasting, I kept glancing at the third cordial – Craneberry – and wondered how a distillery that consistently demonstrates such painstaking attention to detail could have flubbed the spelling of “cranberry” and allowed the error to remain on the label. But the extra vowel isn’t an oversight – “craneberry” is the word that early Massachusetts settlers used to refer to the cranberry flower, which resembles a crane. Here it’s a rum-based liquor infused with Cape Cod cranberries and aged with citrus in cabernet barrels. Like the Amandine and Angelica, the Craneberry is full-flavored but not overly sweet. A seasonal release, this is a holiday cocktail waiting to happen. The tasting closes with one of GrandTen’s standard offerings – and another history lesson. Fire Puncher vodka was the distillery’s second product, and with its spicy bite, represents a thumbing of the nose at the preponderance of soft, fruity vodkas on the market. Each batch is distilled with 10 pounds of those fresh chipotle peppers, and Lonnie again credits the local ingredients with imparting such a unique flavor to the spirit. And while the label warns that the spirit is “not for the faint of heart,” the final product is much more about flavor than heat. The vodka has a big, pure pepper essence, and the heat stays on your lips instead of setting your esophagus aflame. Hickory smoke, which is bubbled through the vodka before bottling, rounds out the flavor and makes for a smooth, warm spirit that seems destined for a bloody mary. The name “Fire Puncher” is inspired by an incident from the distillery’s illustrious past. A fire broke out in the foundry one night in January 1887, and before the fire department could arrive, a concerned chap by the name of Tommy Maguire took it upon himself to climb up to the roof and fight the blaze – with his fists. His efforts, however well intentioned, earned him a ride in the paddy wagon. Sadly missing from our tasting is Fire Puncher Black, a variation of the chipotle vodka made in collaboration with Taza Chocolate of Somerville. The combination of dark chocolate and spicy pepper sounds divine, but the stores are depleted (don't fret – it'll be back). And while it was only intended to be a limited-edition product, its absence highlights one of the challenges inherent in small-batch distilling – when a spirit runs out, sometimes it’s really, truly gone. Such are the facts of life for a distillery of this size and tenure. Capacity limitations and the inflexibility of the aging process directly influence GrandTen’s product line, even more than they would for a larger, older outfit. Regardless of the volume of spirit GrandTen can produce, there’s only so much space to store it. And products that require barrel aging can’t be hurried along. If GrandTen ever has designs on releasing an original, 12-year-old whiskey, they need to get the spirit in barrels spirit today if they want it on shelves by 2026. Even now, an unexpected spike in demand can disrupt production schedules or, in the case of the barrel-aged spirits, lead to a gap in availability. But while GrandTen’s output is restricted by time and infrastructure, their freedom to experiment with handpicked ingredients and design original, innovative recipes is limited only by their collective imagination. Unlike industry titans, GrandTen isn’t tethered to age-old recipes or methods. Someone operating a still at Beefeater doesn’t have license to throw a handful of cranberries into the botanical mix to see how it might alter the gin’s flavor. But at a microdistillery, an idea like that has the potential to become a signature product. GrandTen’s facility might look a bit like a garage, but it functions more like a workshop. It’s a creative environment in which energy and ingenuity thrive, risks can pay off, and even missteps have value. The result of that combination of artistry and grunt work is a line of unique, homegrown spirits for a city that’s come to appreciate quality and recognize nuance in its cocktails. Every night we crowd into places like Backbar and Wink & Nod and wait for original, well-executed drinks made with the best ingredients by the most talented mixologists. It follows that we should seek out the same passion, patience, and devotion to craft in our spirits. And if you find those qualities in a bottle with a crooked label, well…just consider it a personal touch.